Born in England and raised in Spain, Charles Ward arrived in Japan with no idea that his new profession would be a springboard to activism. However, a year and half into his work as an English conversation teacher he felt he had yet to scratch Japan’s surface, so he decided to bike the length of the country to obtain a fuller understanding of the land and its people. During this bike adventure, Ward felt his first call to activism: the need to raise awareness around Article 9 of the Japanese constitution. Called the ’Peace clause’, Article 9 renounces “the threat or use of force as means of settling international disputes” and states that “land, sea, and air forces, as well as other war potential, will never be maintained”. At the time of Ward’s bike trip, debate was underway between pacifists who were proud of the article and those calling for it to be revised to allow incremental armament or even militarisation. With a good understanding of Japanese traditional culture and an awareness of the country’s love for all things kawaii (cute), Ward conceived of a form of activism that tapped into the hearts and minds of the Japanese. Using origami — Japan’s traditional paper folding craft — he began making a paper dove that he called Kyu-chan (kyu means the number nine, and chan is a suffix used as a term of endearment.) With Kyu-chan in hand, Ward would stand on street corners asking people if they knew about Kyu-chan and Article 9 (which many did not). He found immediately that, put at ease by this kawaii character, people were willing to engage in conversation about a timely issue. After his bike trip, Ward settled back in the city of Matsumoto to open a private English conversation school. In his day-to-day life, he began to notice the unnecessary waste caused by disposable items, such as packaging, plastic bags and wooden chopsticks. Again he decided to invoke the power of kawaii to highlight the growing problem of one-time-use and disposable items. Ward began drawing yon-koma manga (Japanese comic strips) with plastic bags and wooden chopsticks as characters. He named them Fukuro-chan (plastic bag) and Ohashi-san (ohashi means chopstick and san is an honorific suffix). As a way to advertise for his English school and cut down his eco-footprint, he placed these comic strips on the back of his school’s flyer and started handing them out. Before he knew it, his school was full and the kids were eagerly awaiting the next comic strip to be released with Fukuro-chan’s adventures. “By bringing a simple inanimate object to life, we start to appreciate the value of things and understand where things come from and where they go once their use has come to an end,” said Ward in a recent interview with Our World 2.0. It is through these cute images and sense of humour that Ward is transforming people’s ideas about the use of everyday things around us. While the ecological message may not seem overtly apparent in each individual comic strip — of which he has written about 50 to date — Ward believes that this approach works. “That fact that it is accessible, the fact that it is not in-your-face, that the message is not so direct, makes people want to find out more,” he said. 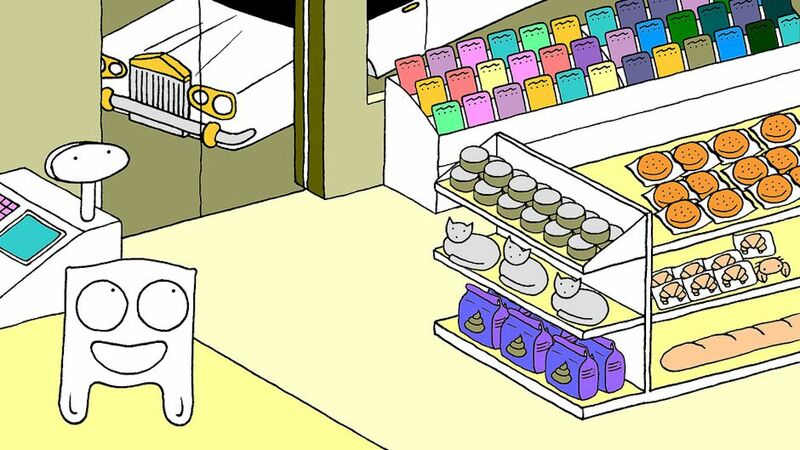 Ward’s manga strips are growing in popularity and have recently been placed in a digital display at the Parco Department store in Matusmoto and Chiba City. He has even produced a ten minute short video (see trailer below) — a love story between Fukuro-chan and mysterious red paper bag — which recently won the runner-up prize at the Matsumoto Shotengai-Eigasai film festival. Ward has begun to sell Fukuro-chan goods on his website, such as postcards, colouring books of Fukuro-chan’s adventures, and a Fukuro-chan emblazoned tenegui (a thin, traditionally weaved Japanese cloth) made from organic cotton. For every item purchased, Ward plants a tree via the Plant A Tree Today Foundation, an organization that plants oil trees in Thailand to produce biofuel and sequester CO2. To date, Ward has planted nearly 700 trees towards a goal of 3,000. While Ward recognizes that reduction in the use of plastic bags is the ultimate goal, he is also keenly aware that so-called reusable eco-bags are often made out of synthetic materials and are shipped in from abroad. On the back of the paper packaging of the Fukuro-chan tenugui are instructions to make a number of do-it-yourself items, including a Fukuro-chan eco-bag. Ward is also planning to take his initiative to reduce plastic bags to the next level. He plans to approach department stores and supermarkets to convince them to keep a stash of used plastic bags available at the check-out counter for customers to use as an alternative to new bags, as well as providing a place for people to drop off their used bags for reuse. He is also starting a sticker campaign to reduce the amount of junk mail people receive. Ultimately, Ward would like to see Fukuro-chan as popular as Hello Kitty or another all-time favourite Japanese character named Doraemon. Harnessing Cuteness To Cut Plastic Bag Use by Megumi Nishikura is licensed under a Creative Commons Attribution-NonCommercial-ShareAlike 3.0 Unported License. There is an important message here for everyone involved in trying to shift consciousness. Ward is skillfully using a kind of aikido approach to great success. Outstanding! I also note how much a gaijin cares for and respects the Japanese people and culture, and feels inspired to participate in making improvements, for the sake of the country and the world. He’s a tremendous role model! Thanks, as ever, Alan. You are so right, Charles is indeed a very inspiring and special person! Also, the second culprit are surely the clear plastic bags (freezer bags) that check-out attendants just love to put over anything that looks like it might leak, fish, meat, sushi, bentos etc… Turning this phenomenon around would surely be difficult in this country…Or am I mistaken? I share your frustration Greg – there is no doubt that the culture in Japan is to wrap every single item as many times as possible. But that does not mean that there is no point to Charlie’s initiative. Firstly it is directed mainly at children who might one day lead us into a better, smarter and ultimately more efficient system. Hopefully the impact of such campaigns is made beyond just plastic bags. Also, in the same way that recycling is now ingrained in people here, re-using and bringing your own bags can also become the norm, but this will take time and policy leadership. (On a practical note I have had trouble finding sustainable non-plastic garbage bags while living in Japan). At the risk of sounding like an economist, putting a price on plastic bags might be necessary, unless we have a fundamental change to our values regarding nature. In Norway and other countries you get charged per bag at the supermarket and so people suddenly don’t find it a hassle to bring their own bags anymore. 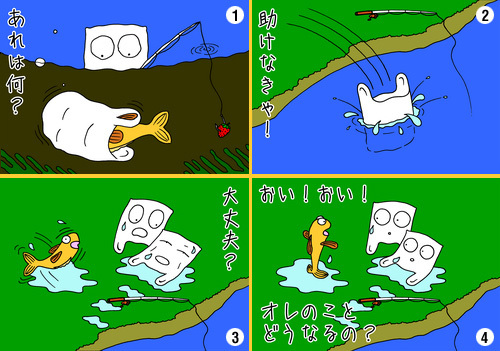 Finally, I think this initiative illustrates the tension between hard-core environmental campaigning which scares people, and friendly or culturally-sensitive ways such as through Fukuro-chan. My gut feeling is that voluntary approaches are not sufficient in the long term given the scale of global problems re: biodiversity, fish, water pollution, climate change etc. Still, any initiative to raise awareness is worth pursuing and hopefully this leads to smarter policies. and that occasional plastic bag should suffice for garbage.